Ever since my husband and I bought this house, we've made a concerted effort to be more eco-concious, and desire to live a more sustainable lifestyle. My husband and I have been working on a project up in the attic. 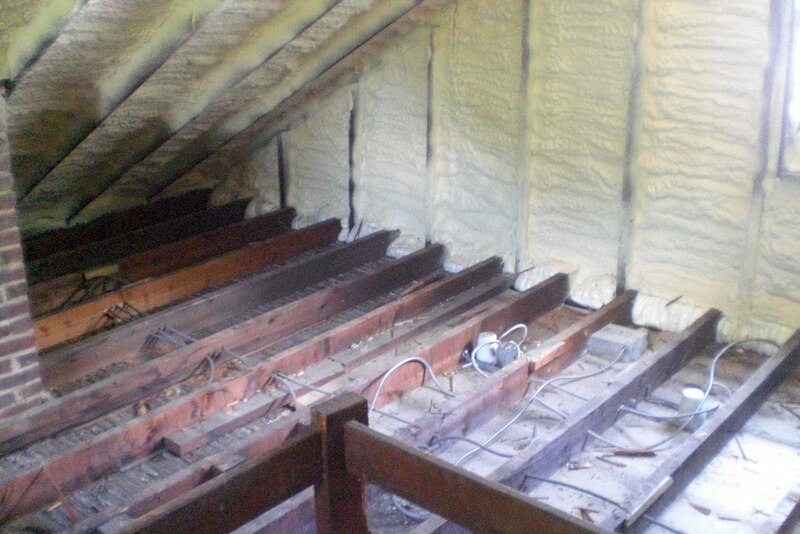 We are turning the "attic" into usable space. We need to put in floors, and dry wall the whole 9 yards. My husband has been working on removing the old wood plank floor in the attic to get it ready for a new floor. The old wood is original to the house. 109 years old to be exact! 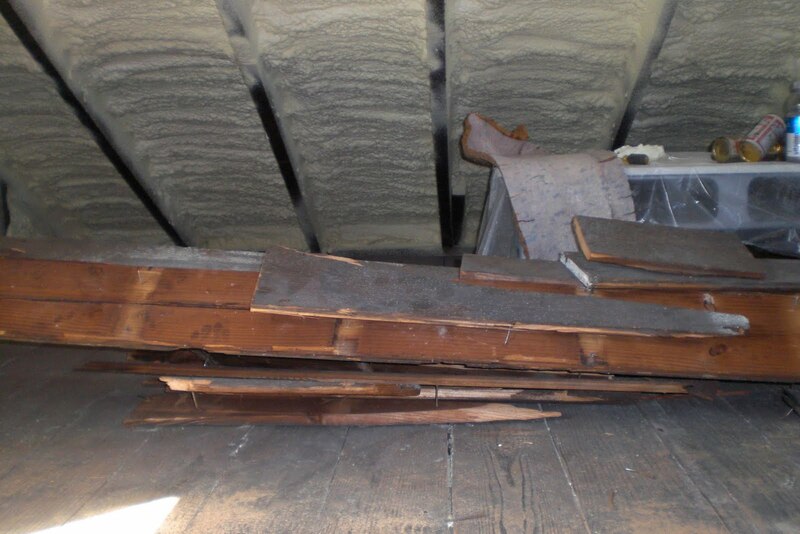 We are replacing it because it's not going to support the weight of furniture nor people and we want to put in insulation under the floor. 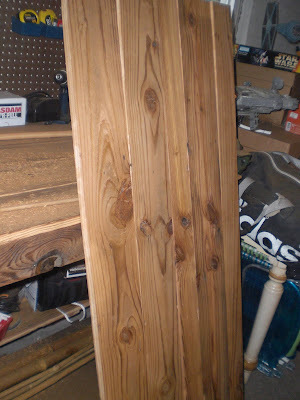 The hubs wanted to re-use this wood so he carefully removed the wood and tried to salvage most of it. 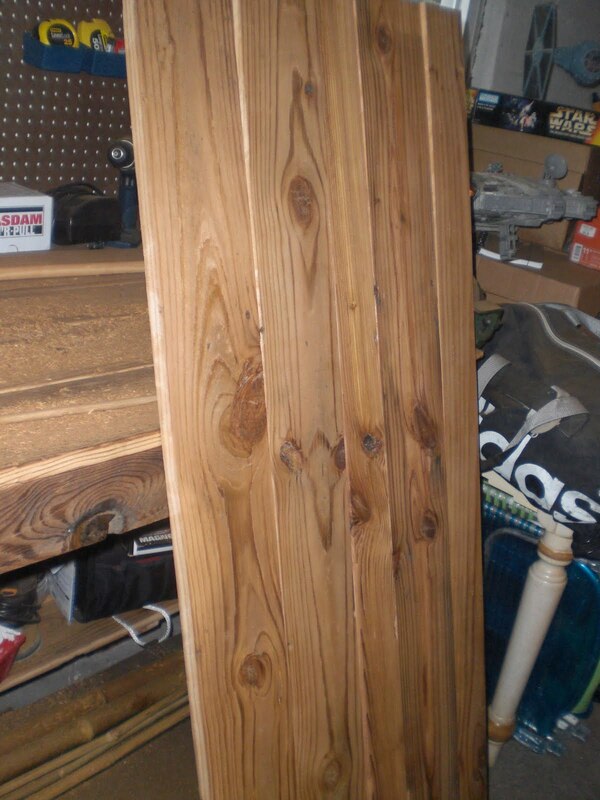 He took the wood planks, planed them and sanded them. It was a lot of work! It has taken him a month to remove the wood pieces, and get them ready to make me... a garden bench!! Isn't it beautiful? My husband is the best! Even though he works a full-time job, he's been working on this garden bench before work, on his days off, you name it. I love it, it's so perfect! Even more so, the fact that we could re-use / recycle the wood from the house and not spend a dime on materials, priceless! I love green projects! There are not only environmentally friendly, they are economical as well! The only money we spent was $10 for the circular barbeque grill replacement part that my husband put in for me to catch the dirt as I pot things. He used a jigsaw to cut a hole and fastened the grill under it. Neat right?? 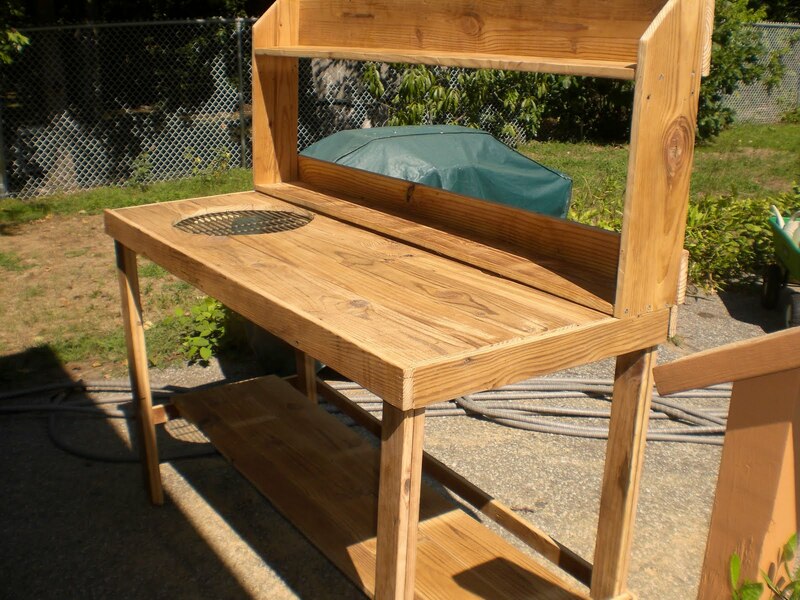 I found this potting bench that looks like the one the hubs made. Check out the price!! Wow, so expensive! Saving money and the environment feels awesome! Oh, and check out the Tool Bench he built for himself out of the same reclaimed wood. Two pieces of furniture out of wood from our attic floors. Totally...Awesome! Awesome is right! Beautiful benches, especially that potting bench. Much prettier than the $$$ one. We used reclaimed products for most of our garden shed last year. It took a bit more work, as the OSB was in odd sizes, but the pieces were free. Our windows were rejects from my son's job, nice RV windows...tinted sliders with screens. We probably cut the price of the shed in half over using all new products. This is totally awesome that both you and your husband are so eco-conscious and that your husband is so handy to be able to reuse and recycle old wood to create such beautiful and useful pieces of furniture. 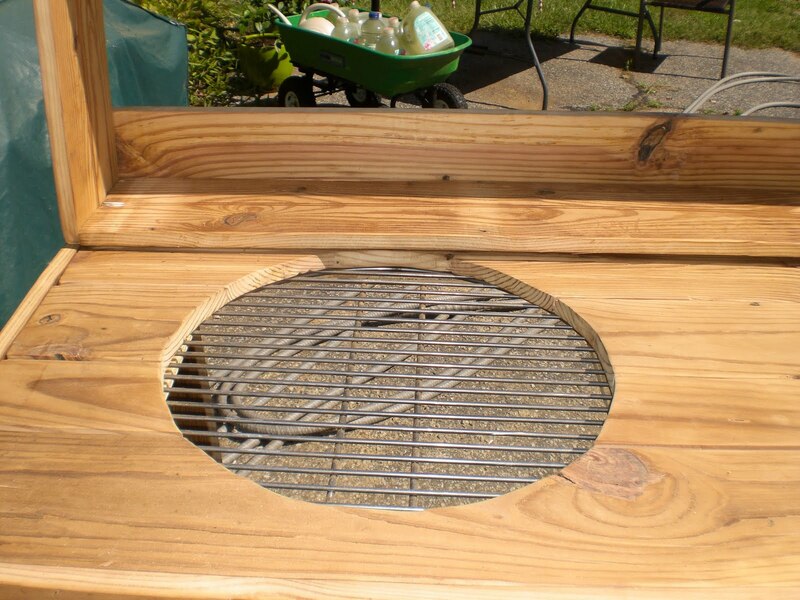 The grill for catching the potting dirt, is there something under the grill to actually catch the dirt? I couldn't see it in the picture. However he did it, that's just ingenious! Where did you place this lovely garden bench? So cool that your husband made you the garden bench. I'm sure you'll get lots of use out of it - my favorite part is the grill! What a great way to use the wood. I am sure you will have lots of use from the new potting bench. I love mine.The new workbench is totally gorgeous! Very nice! Some great ideas can come from re-purposing old stuff can't they? Also you were the winner of the EcoSMART Weed Killer package! Email me your mailing address and I'll have it sent ASAP. 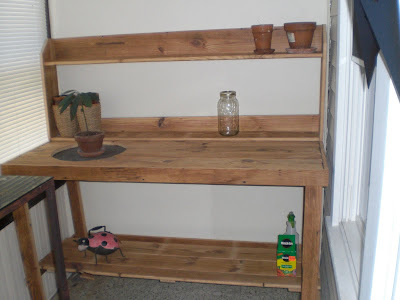 That is one fabulous potting bench and one great husband to build it for you. Welcome to Blotanical! It's beautiful!!! And so special because of that precious 109 year old wood! Your husband is amazing!!! Tell him I said so! I see that you had foam insulation sprayed into the eves and attic walls. We have that throughout our new home. It's wonderful stuff! Both benches are wonderful! You have real heirlooms there since the wood is so old and from your home. I love the way he planed them down and made them so beautiful! Lucky you to have such an industrious husband. He deserves a very special treat and extra hugs tonight. Love it! I forwarded the link to my husband since we have a lot of old wood that we saved from the garage that we are tearing down. Great idea! Your fellow did a great job. The price is great too! What a fantastic bench! And I love the circular inset grill - I've not seen that in a potting bench before but it's such a good idea. Great design and materials and made by a loving husband - can't ask for much better than that. Wow! This is awesome! 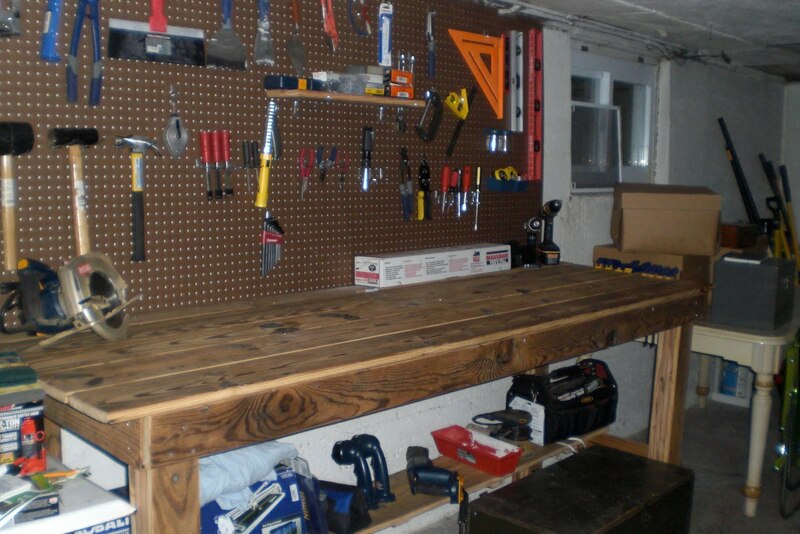 That is a nice piece of work done on both the bench and the work table. I love the grill on the potting bench too. This is definitely the way to re-use. Thanks for sharing! I love the garden bench. Your husband did a great job! The grill is ingenious! I wish I had thought of that when I was building my bench. I see many great potting days in your future. Wow! I am so jealous! I want one of each please!